The Environmental Working Group (EWG Skindeep), the organization also behind the Cosmetics Database, have completed their 2012 sunscreens report with some surprising results. Sunscreens prevent sunburns, but beyond that simple fact surprisingly little is known about the safety and efficacy of these ubiquitous creams and sprays. 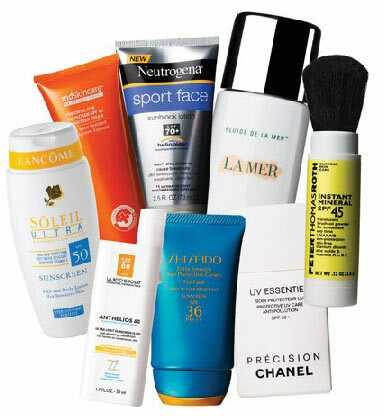 Last year, Gisele Bundchen made the statement that sunscreen is poison and therefore doesn’t want to put that on her skin. Despite the unknowns about sunscreens’ efficacy, public health agencies still recommend using them, just not as your first line of defense against the sun. Avoiding too much sun is still the best remedy. There’s no consensus that sunscreens prevent skin cancer. There are dozens of high-SPF products — but no proof they’re better. The common sunscreen ingredient vitamin A may speed development of cancer. The researchers came up with a list of super safe sunscreens, in which none of the real big brands was listed. The only names I knew were Mustela and La Roche-Posay, which I found really disturbing… The list of products they researched is extensive, but unfortunately not complete. I wanted to check the Nivea sunscreens I am using and they were not on the list, and to be fair, Nivea is not a small brand. Check your sun products here. Click here for more information on the EWG research and sunscreens in general. This entry was posted in Beauty and tagged efficacy, EWG, safety, sunscreens by sofischoice. Bookmark the permalink.